Sheila was one of a kind. Really multi-talented and so much fun to be around. Artie, My heart and thoughts are with you. God rest her beautiful soul. Artie, I’m sad for your loss. I never met Sheila, but you spoke of her so often during our years at Warners, I knew she was a big part of your life. May you keep her alive in your memories of those wonderful, heartbreaking, dramatic, top of the world times. Sad to hear the news. My heart goes out to the family and I’ll send good karma your way. Rock on! My deepest condolences on your loss…the one thing that can never be taken away from you is all of the memories you have, and I know you and her family cherish your memories and time with her dearly. My thoughts are with you during this sad time. So sorry Artie. She must have been a great lady. So sorry to hear the news Artie. R.I.P. Sheilah. Artie, I am so sorry that you have lost Sheilah, a deep friend and so much more. How lovely that you have remembered her here, for her, for those who knew her, and for those (like me) who missed the opportunity. The longer we stay in this life, the more friends we must bid farewell. Let’s use our time here to love and appreciate each other till we ourselves make that mysterious journey. I know you do, and this reminds me to do the same. Oh Artie just a couple of days ago we were laughing about excerpts from your book and tonight I open the email and read that Sheila has passed away. I had to rub my eyes because I just woke up and I couldn’t believe what I was reading. I have so many lovely memories of her. I met her when I was 19 and I thought she was the cats meow. You invited me and Ronnie over to your apt. probably to hear some songs and when we walked in there was a very beautiful young woman who had a silky smooth voice and you introduced her as Sheila (your wife). I thought you were kidding. As I recall I think I even asked Ronnie if she was REALLY your wife. I remember this as if it were yesterday. She asked if we’d like something to drink and she brought out Lipton Lemon Iced Tea and Pepperidge Farm Cookies. She had me . I thought she was probably the coolest WIFE ever. I thought you lived on Cookies and Tea (with the girl who sounded like the Beatles) later I found out that she was a California girl. I didn’t care. She was sharp and sophisticated and just the hippest girl I had ever met. She was like Sheila in “Hair”. The last time I saw her was when she was living in the building that I live in now. I had come out from Vegas with a friend and Sheila took us to the Antique Mart. I was just talking with a neighbor about her a couple of months ago (the person who lives in her old apt. and I told them that she got the landlady all ticked off at her because she had painted all of the wood floors white. Her apt looked like the Beatles “White Album”. My neighbor told me “you’re right , he went in his closet and lifted up the rug and there was the white floor”. Once again Sheila was ahead of her time. She’s still with all of us who knew and loved her. She’s right in our hearts. Rest In Peace Sheila you’re home now and I’m sure you’re having cookies and tea. I will keep my loving memories of you until we meet again. I was telling a friend all about her just two days ago. And, like Sun, we were talking about the white floor and SheilaH’s amazing creativity in so many ways. That woman could make beautiful things out of seemingly nothing. We were close for a few years before she married David but we went way back to her days with you, Artie. Even though we lost touch long ago, I still thought and spoke of her often. Her memory is alive and well and in living color. Artie…so sad to hear about Sheilah’s passing. As you pointed out, I worked with her at Mercury in 1965. when we were both so very young. It’s where you and I met as well. I hadn’t seen her or been in contact for ages but I carry around the sweetest of memories for all this time. I hope her family is comforted by the fact that she was loved and appreciated by so many. I am so deeply sorry for Sheilah’s passing. Not for Sheilah because I know she is surrounded in joy now, but for you and her family and friends who are left with this great vacuum where her physical presence used to be. I have never known another divorced couple who remained so close. She was more than your wife, and later your friend, your souls traveled together in harmony. She was always so cool, that smoky voice and deep-throated laugh, her continental demeanor. All of it produced an effect which was stunning. I thought of Sheilah just last week watching David Warner in a film here in London. I remembered all the times the 3 of us sat together in your various living rooms and talked and laughed. The day she bought my MusTANG as she pronounced it! Too many memories to count. What a wonderful person to have traveled with, still it makes the passing so much harder. My love to you, my friend of over 40 years. Thank you for sending our song her way. I will send you a piece to pass on to her family. I am deeply saddened as I reflect on your email to me this morning !!! I know you will miss her dearly!!!!! My thoguhts are with you at this time of sorrow and the fond memories you will always have of her smile & laughter. Artie: I always marvel at the responses to your postings. It was about the time of the wonderful photo of you and Allan and Sheila that I met you, so never had the pleasure of meeting Sheilah, the woman who captured, and inspired you, and it seems helped make you the wonderful creative crazy person you are today. I know you will hold Sheilah in your heart, as you have held so many memories, experiences and dear friends. We never lose those we love, they are always with us, waiting, inspiring. 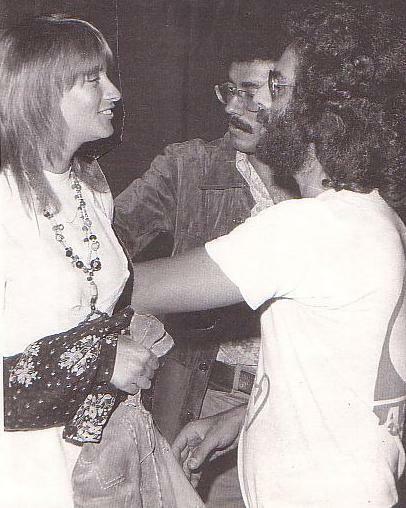 Artie: Meeting Sheilah with you in 1968 made me see you as more than a fleeting Shadow in the music world and led to our long friendship. Seeing how your divorce only brought you closer together in spirit has deeply influenced my own relationships. Sheilah worked for me briefly during my Columbia days in the early 70’s, as a favor to me actually, since she was so far beyond the kind of stuff I was involved in. I don’t think I ever exchanged a cross word with her, which, during those days, was a rare thing. Nobody’s mentioned how Sheilah changed gears after her marriage to David and became a unionized driver for the movie biz. That’s what she was doing the last time I saw her and she was as happy and uplifting as the first time I met her. Artie, my sincere condolences. I can’t imagine the pain and sadness you’re feeling. May peace and comfort be with you, with her, and all who knew and (from the comments, obviously) loved her. There is no death, only a loss of the physical presence. In the Garden of Life we are all perennials. We are all eternal. There is no death. No one is dead. The only difference is that now we do not have their physical presence.And while that is a great change, they still love you. You still love them. The relationship continues.Only now the relationship is on the spiritual plane.It is our vision which is limited, not their presence, not their being. And while we cannot hold them, see them, or hear their voice as we did before, they are not dead. And in that loss of the physical is the promise of the spirit, of being with them again in greater love and understanding. Life is all in a moment. We are all traveling on this beautiful planet Earth whirling through space. Like all vacations, it’s a wonderful experience, but it’s always good to get Home. Sitting by my brother-in-law, Tony, as he lay dying in a hospital bed, this thought came to me. There will be a time when Tony is ready to transcend. It will be his spirit that decides when the moment has come, his spirit that will answer God’s call, then his body will die. The body doesn’t die and release the spirit, but the other way round. When our spirits take flight, when our spirit has done what we came to do, when our work is completed, when all things are settled and accomplished, our bodies die. It is our spirit that gives life, and that connection to God will never die. I remember her so very well. I remember you both as a striking couple. Beautiful woman, blonde. Terrific personality. May she rest in peace. I am so sorry to hear of your loss. No matter how many years may have gone by, no matter how life may have intervened, the love was real and the loss is real. Art remembers her fondly. I never met Sheilah, but she sounds like she was a wonderful person. Please accept my heartfelt condolences. What a beautiful tribute to our darling Sheilah.She will always be in my heart.I remember so fondly staying with Artie and Sheilah in their apartment on west53rd(? )We always had lots of fun;there was always music playing;Artie singing, people coming by. It was an exciting time to be in New York city those days.And Artie and Sheilah made me feel so welcome as I began my career in the theatre. Thanks for those wonderful memories.And may all of us who knew her recognize that she was a rare and extraordinary being.heather Mac Rae. Sheilah was simply unique, and a very dear friend who I met when she lived here on the island of Menorca. I have just moved into the village of Llucmaçanes, in fact into the house next to to Sheilah’s old farmhouse….and for company I have her very special friend, Minime, her cat,…so I still have a connection with my dear friend Sheilah. Sheilah left a lasting impression on everyone she met, and it was a joy to have her as a friend. Malcolm, Llucmaçanes, Menorca (Balearic Islands). Such sad news. I first met Sheilah in 1985 in London. I was living on take-out food in the city. Sheilah lived in Barnes with David and their beautiful daughter, Melissa. Sheilah asked me what I really liked, what I really wanted. I told her: roast chicken, mashed potatoes and lots of gravy. And so I went to see her on many, many Sundays and she cooked roast chicken, mashed potatoes and lots of gravy. We talked for hours and hours about anything and everything. She was such a beautiful person. Artie, my heart goes out to you and to Sheilah’s family….She was a talent and a force……I will never forget her kindness, intellect and soul ! Sheilah R.I.P. !